Iran has warned Turkey against military intervention in Syria, as the Islamic State tries to take the Kurdish center of Kobane in northern Syria on the Turkish border. During our preliminary consultations with Turkey, we have found out that this country does not seek escalation of crisis in the region and we hope it would play a positive role in this regard…. Regional talks are underway over this issue and we hope a serious measure is taken in this regard. Turkey and Iran are on opposite sides in the 43-month Syrian conflict. Tehran supports the regime in Damascus, while Ankara is insisting not only on operations against the Islamic State but also on support of insurgents to remove President Assad. 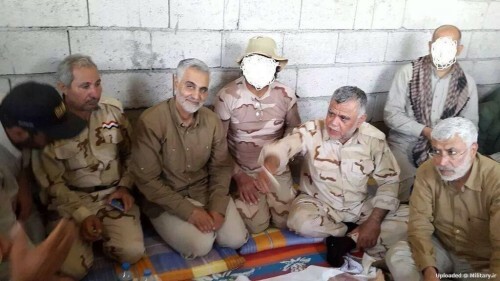 A photograph is circulating of the head of the elite Qods Forces of the Revolutionary Guards, General Qassem Soleimani, has met leaders of Iraqi militias. The militia leaders include Hadi al-Ameri of the Badr Corps and Abu Mahdi al-Muhandis of the Hezbollah Brigades. The banned reformist newspaper Bahar has been cleared by the Press Supervisory Board of charges filed by the Iran Prosecutor General. The newspaper had previously been banned for six months by the Board, but after the latest decision, managing editor Saeed Pourazizi was acquitted by a judge of publishing libel and disturbing public opinion. Pourazizi has been put on trial three times in the past year. The Rouhani Government has rebuffed the call of prominent MP Ali Motahari to release opposition leaders Mir Hossein Mousavi, Mehdi Karroubi, and Zahra Rahnavard held under strict house arrest since February 2011. In a letter published this week, Motahari accused the Government of failing to take effective action over Mousavi and Karroubi — both candidates in the disputed 2009 Presidential election — and Rahnavard, Mousavi’s wife and a leading artist, academic, and activist. Mr. Motahari is a courageous, moral and outspoken MP who expresses his views in compliance with his duties as a representative; however, he certainly does not have all the information. The government does not feel it has to publicize all of its actions at all times. Rouhani promised in his 2013 Presidential campaign that he would free political prisoners, including Mousavi and Karroubi. Nobakht insisted that the Government remains committed to resolving the issue of the house arrests and its other campaign promises. Iranian officials have said talks with the International Atomic Energy Agency this week in Tehran, covering inspections and supervision of nuclear facilities, were “very constructive“. The IAEA delegation, led by Deputy Director General Tero Varjoranta, was pursuing full implementation of guidelines agreed between Iran and the Agency in November and February. During the talks, the whole bilateral issues were discussed, including the ways on how to complete the two agreed practical measures and the approaches ahead. The negotiations were very constructive, serious, and explicit. He said the next meeting will likely be held in late October. The IAEA said in September that Iran has implemented three of five transparency measures but had not fulfilled two, both related to detonators and explosive devices that could be used in a militarized nuclear program. Four border police have been killed in two attacks on a border post in Sistan and Baluchestan Province in southeastern Iran, most likely by the Sunni insurgency Jaish ul-Adl. Jaish ul-Adl has carried out a series of attacks on Iranian security forces in the last two years, including the killing of 16 border guards last October and the abduction and murder of five in March. Iran Police Chief Esmail Ahmadi Moghaddam said that investigations continue to seek the identity of those in the latest attacks on Wednesday and Thursday, near Saravan on the Pakistani border. He also issued a warning to Islamabad, “This is not acceptable that the terrorists use Pakistan’s soil to hit us….Preventing such incidents is their responsibility,” Ahmadi Moqaddam stressed.